Date: 18th & 19th October 2008. 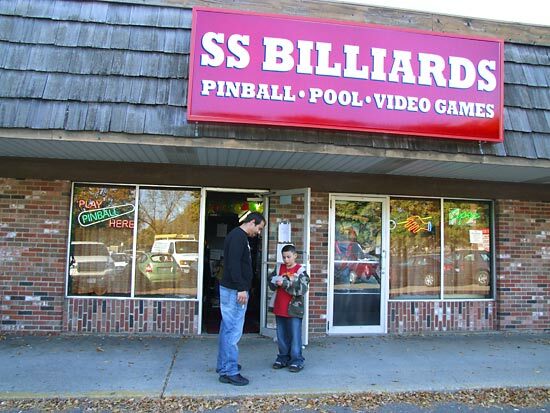 Location: SS Billiards, 732 11th Avenue South, Hopkins, Minnesota, USA. 55343. 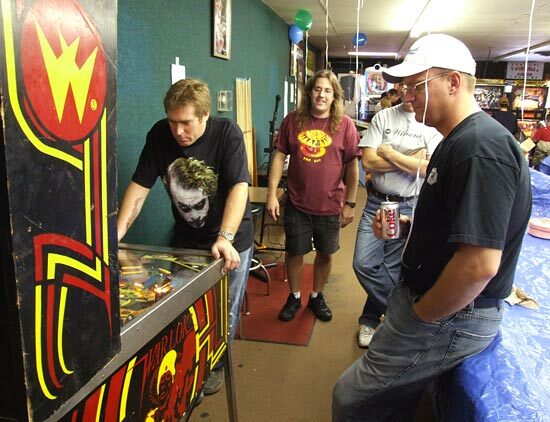 This was the second Pinball Circus of the year and it was well attended by pinball fans from the surrounding area. It was held, as usual, at SS Billiards and hosted by owner Lloyd Olson. Entry to the Circus cost $25 for two days which bought you a numbered ticket which would then be entered into the prize draws which took place throughout Saturday. Once they had bought their ticket, visitors found a good selection of machines made up from Lloyds regular collection and some additional games kindly brought in by Circus-goers. The pool tables were covered with blue sheets and the additional machines slotted in between them and next to the walls wherever a suitable space was found. The inclusion of a rare Global Warfare by Game Plan - only 10 prototypes were made - an original Big Bang Bar - 14 made - and a Warlock - 412 were produced - gave visitors the chance to explore some games they may not have played before. 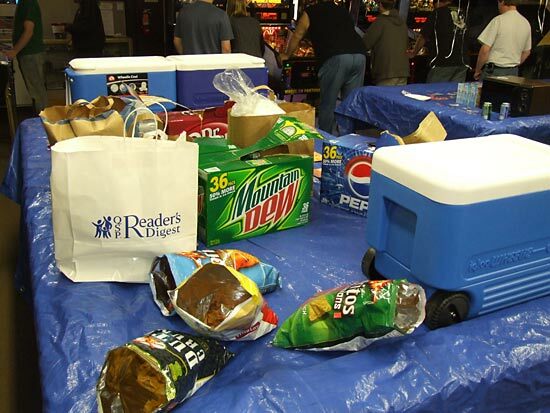 In addition to the machines, there was a steady supply of food and drinks. 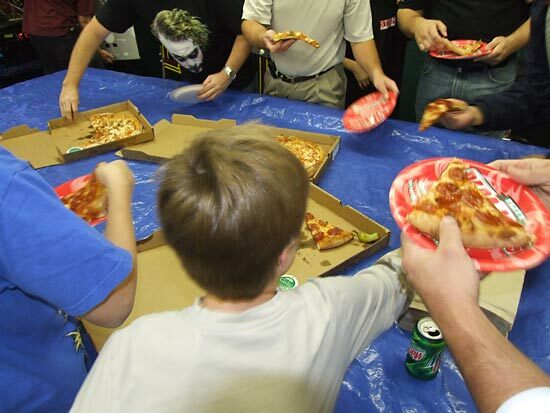 Hot dogs, corn chips and cans of various soft drinks were available throughout and they were supplemented by regular deliveries of magical disappearing pizza. This Circus's pizza proved to be extra magical, disappearing in record time - sometimes even before its arrival was announced. 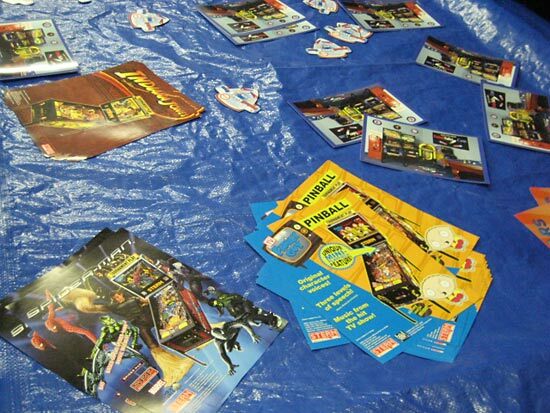 On another of the covered pool tables, flyers for Indiana Jones, Spider-Man and Family Guy were available for those who like to collect such items, together with some promotional materials from Pinball Sales. The Circus was a two day event with the main focus on the first day's activities. 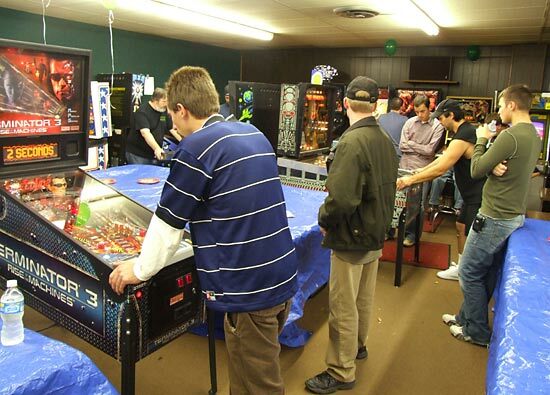 All the machines were set to free play and several tournaments took place combined with regular prize draws. On Sunday, there were no tournaments, draws or food but the machines remained on free play and the venue was restricted to those who bought Circus tickets. 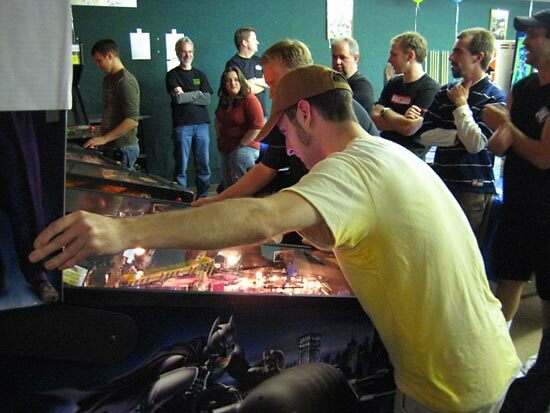 Saturday's first tournament was the appropriately named Saturday Night Pinball. Everyone could enter for no additional charge and when the sign-up period was over, names were drawn in pairs out of the bucket. Three machines were chosen to play and the first one to register two wins continued to the next round. 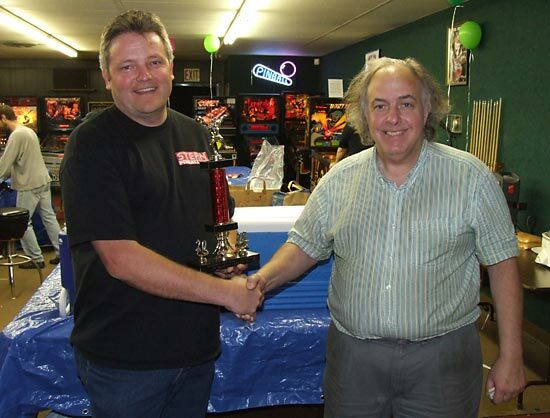 Some extended game play caused the tournament to continue a little later than normal but the winner was Mike Ruel who received his trophy and $50 cash prize from Lloyd. 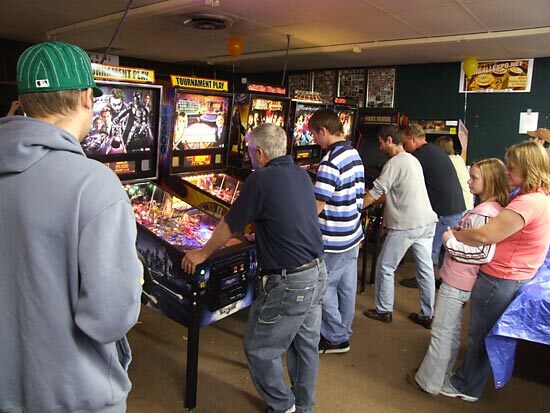 In order to allow it to finish at a sensible time after the extended Saturday Night Pinball, the rules for the Pinball Circus Tournament which followed on immediately were amended to change it from a best-of-three-games format into a single knockout game in each round. 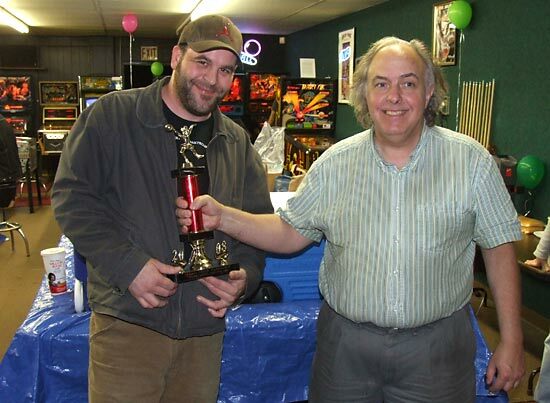 The Pinball Circus Tournament proceeded fairly rapidly under the new rules and by 1am the three-way final had taken place on Spider-Man with Jeff Vansickle achieving the highest score to take home the trophy and $50 cash prize. The six modern Stern machines were all running ToPS tournaments with a $20 cash prize and choice of translite for the winner on each. The tournament was a simple high score played with a single ball and no entry fee where players could enter as many times as they wanted from midday to midnight on Saturday. By midnight, the winners on each machine were announced and their prizes awarded. There was an additional tournament - the traditional Goose Egg which is a high score tournament with a twist of some kind. This time it involved playing the Batman game with one hand on the backbox and the winner was Ryan Trego who collected his $20 prize and his choice from the selection of translites. For those who didn't win one of the tournaments, there were still plenty of chances to take home a prize thanks to the frequent raffles. All the tickets were separated into two parts and the smaller piece went into the bucket. 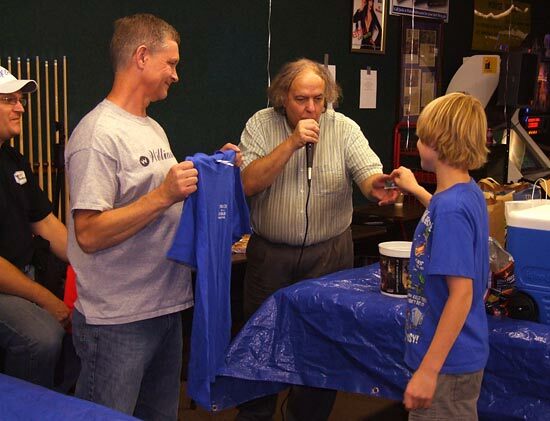 At various times throughout Saturday, Lloyd would announce the draw for the next selection of prizes. Bryan Kelley displayed each prize as one of the younger members of the Circus drew a numbered ticket and Lloyd made the announcements. Sunday was a much quieter day than Saturday had been, but the prospect of unlimited free pinball drew a respectable number of people back when the second day's action started at midday. As the day drew to a close, those who had been good enough to bring along their own machines for everyone to play, turned up to pack them away and take them back home. So another Pinball Circus came to a close. Lloyd seemed happy with the turnout and the up-beat atmosphere across the weekend. Everyone appeared to have an enjoyable time, even when they were crashing out of the tournaments and all the usual ingredients were there to make this another weekend of fun at the Circus. If you want to join the Circus, the Pinball News Diary contains details of the two Circus weekends in 2009 and also the May Day Tournament in 2010 if you want to plan that far ahead.